Hey there, I'm Sampson. You've got my full attention when you tell me what a cute fella I am. That's how they got me to sit still for my picture. Otherwise I'm chasing a cat toy, one of my roommates or even my own tail sometimes. I am energetic and playful but I also enjoy affection. 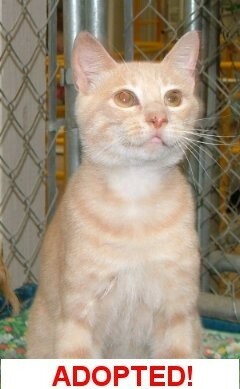 My story is like so many other cats that reside at M'Shoogy's until we find our permanent homes. I was dumped out by Angel's Vet Express and left to fend for myself. From the looks of things, it's an all too common occurrence. Life is definitely easier on the inside. Do you have any idea how much trouble you can get into on the outside? Let me tell you, way too much. I'll wait here, where there is plenty to eat and a warm safe place to sleep until that special someone comes to get me and take me to my new home. I can't wait.